The announcement came two days after Prime Minister Netanyahu announced that Israel would not be extending the mandate of TIPH, the Temporary International Presence in Hebron. WCC has recently come under fire from Im Tirtzu, NGO Monitor, DMU and other pro-Israel organizations over its illegal anti-Israel actions. 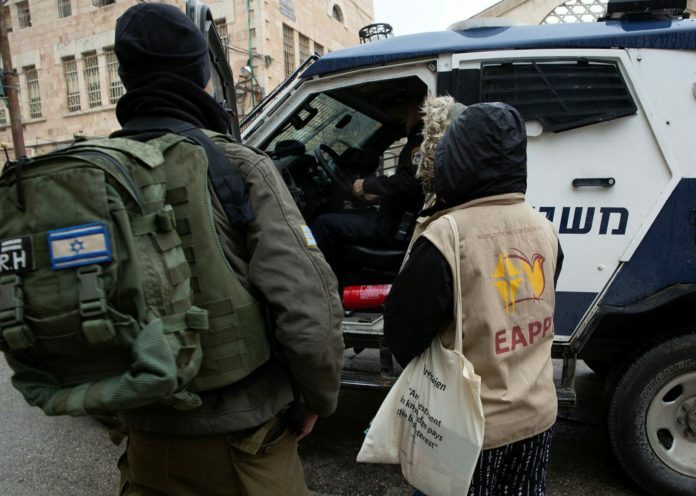 The senior source said that the EAPPI activists enter Israel on tourist’s vises and present themselves as pilgrims but actually engage in political activity, which is illegal. NGO Monitor, an independent research institution that tracks other non-governmental organizations (NGOs) that use the humanitarian banner as cover for anti-Israel activities, has pointed out in a report published Monday that the WCC does not run similar activities in other conflict zones, and “by singling out Israel, EAPPI embodies anti-Semitism,” as defined in the International Holocaust Remembrance Association’s (IHRA) working definition. After conducting a comprehensive study of EAPPI’s organizational structure, funding, and goals, NGO Monitor concluded that despite marketing itself as a human rights and protection program, EAPPI places significant emphasis on anti-Israel political advocacy before, during, and after the trip. Similarly, members of Im Tirtzu organization in recent months have been documenting and disrupting the EAPPI activities in Hebron. According to WCC general secretary Rev. Dr. Olav Fykse Tveit, this “intensified harassment of WCC’s programme” caused it to pull the accompaniers. “The WCC accompaniers are currently prevented from fulfilling their role as peaceful protective presence for residents in Hebron,” said Tveit. DMU head Amit Barack told TPS that the WCC decision to pull its EAPPI’s activists, who have assumed the guise of tourists, from Hebron is the result of extensive work by several organizations and activists over an extended period of time. While welcoming the announcement, he said that this was a victory in a battle, but not in the war against “these illegal tourists,” and that activities against the WCC in Israel should continue until the “tourists” are removed completely from the country and their “anti-Semitic and illgal” activities are completely stopped. Im Tirtzu CEO Matan Peleg welcomed this announcement and vowed to continue protecting IDF soldiers. “We are pleased to see that foreign government-funded delegitimization organizations are beginning to leave Hebron,” said Peleg. “These organizations do nothing apart from fuel the fires of conflict and provoke IDF soldiers, and they are the true obstacle to peace. We are pleased that our efforts to ‘film the filmers’ succeeded, and we promise to continue working on behalf of IDF soldiers and the State of Israel.” he added.